The object consists of two pieces. 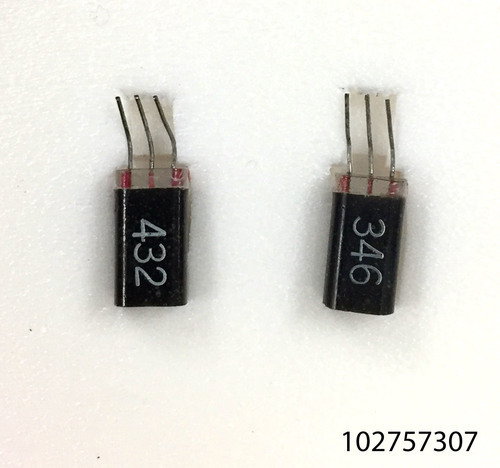 These are the first commercial high-volume alloy junction transistors on the market. They were used in hearing aids. 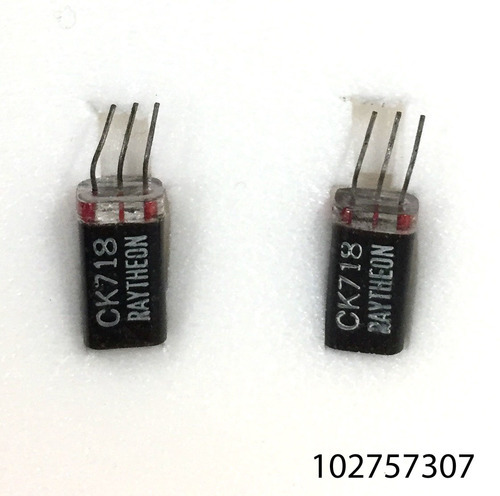 "Raytheon CK718 (2 pieces), germanium PNP alloy junction transistors. 1952 – 1955. The Raytheon CK718 was the first commercial transistor produced in large quantities and was developed exclusively for use in hearing aids. Throughout the 1940s and early 50s, Raytheon was the leading supplier of subminiature vacuum tubes to hearing aid manufacturers. In order to protect this market, Raytheon moved quickly to transistor technology – this was in anticipation that the features provided by the transistor (low power consumption, small size, ruggedness) would revolutionize hearing aid design. As early as 1948, Raytheon experimented with point contact transistors, but found these to be too noisy and not robust enough for hearing aids. Shortly after junction transistor technology became available in 1951/52, Raytheon established large scale production of alloy junction transistors, building on the research of this technology done at GE and RCA. By late 1952, Raytheon was making thousands of the CK718s every week and began to supply these immediately to the major hearing aid manufacturers. The CK718 was sold only to hearing aid companies, and was produced into 1955, when newer hearing aid transistor technology was introduced by Raytheon. Date codes: 346 (1953, week 46); 432 (1954, week 32). Common, with many thousands installed in hearing aids through the mid-1950s. "